This morning I had Michael take a picture of me before he left for work so I wouldn't forget again. Baby Z in all his or her glory! We had a very interesting evening at our house which included eating leftovers (never a hit in our house), selling Michael's work van (yay for no more painting) and having a backyard fire to burn all of the silly things that needed to be shredded. I changed my clothes, but I'm sitting here still smelling that fire/smoke smell. Ugh! Only 2 months from tomorrow until we meet baby! I know that's really a short time, but I really feel like saying....2 MORE MONTHS!!! Anywho....this weeks craft at MOPS was Place Mat Purses. The ladies didn't make them, but they got a demonstration. I had the pleasure and yes I do think of it as a pleasure to sew 13 of them prior to our meeting. I have to say the most fun was jazzing them up with embellishments and making them have there own style. This flower is actually a pin that used to go on one of my maternity tops, but the pin portion broke. I kept it thinking it might be cute on something and sure enough it came in handy. This one I decided instead of putting the ribbon on the inside that I would make it part of the decoration of the purse and add the buttons for fun. These are brads from Stampin' Up. I think it makes the purse look like a button down shirt. I just added an antique brad from Stampin' Up to jazz this one up a bit. And last, but not least the purse I kept for myself. At first I didn't put bows on it and it was seriously the ugliest purse ever. I didn't have the right color of green to sew the handles on so I used brown thinking it would be fine, but my stitching was so off so the lines were horribly ugly. That's when I decided to cover up the stitching with the bows and ta da....cuteness!! I can't believe it's been a week since I posted. I hate being without my camera!!! Luckily I got a call from The Geek Squad that it's in. Tomorrow the kids and I are heading down to Best Buy to pick it up. Hopefully it's actually fixed this time....for real! If not I'm going to be talking to the store manager and I'm going to demand a new out of the box camera...seriously I'm a pregnant lady with 3 kids...I NEED my camera!!! Today I am 30 weeks! I'll have Michael take a picture of me tomorrow and post it then. I'm huge, but I know I'm just going to get bigger. I am starting to fit into my bigger sized maternity clothes and have grown out of quite a few already. Baby is definitely popping out there! I finally had to give in and buy another pillow to sleep with so I could have my leg elevated when I sleep on my left side. I already have a body pillow on the other side in-between Michael and I so I can have my leg elevated when I sleep on my right side. Definitely getting more and more achy! My pubic bone feels like it's going to break in two...good times! My doctor recommended getting a belly band to support my stomach and get some of the weight off my bone. I haven't gotten one yet though. At my last OBGYN appointment I had to take all 3 kids with me...thankfully they were wonderful! The doctor thought Ella was hilarious because she was looking at me with this very hesitant look while she was using the Doppler to listen to Baby Z's heartbeat. I mentioned that she's freaked out by doctors because of her past experience of being in the hospital because of her Hydrocephalus. I guess I had never mentioned that before so she decided to take a look at Ella's ultrasound pictures and was surprised that nothing could be seen on those early pictures. Just to be safe she is having me go in for another ultrasound right around my 34th week. Earlier in my pregnancy I had a dream that I needed to get an ultrasound later on in my pregnancy and I couldn't take it anymore so I decided to find out the gender of the baby. In that dream I found out the baby was a girl and then I was super mad at myself for giving in and not waiting. Even though I wish I knew just for planning and shopping purposes I still really want it to be a surprise so I'm going to stay strong!!! Not sure if I've mentioned it, but I have already washed all the newborn clothes for both boy and girl. They are all waiting in a bag ready to be packed. I always pack my own bag right around the 35th week so I have some time before I need to do that. My SIL Stephanie so graciously offered to throw me a baby shower. Since I seriously I have all the clothes I need no matter what gender the baby is I decided to register for the things that we need no matter what. Things like diapers, wipes, laundry soap, stain remover, batteries and so on. I did register for a few things that have worn out due to being used by 3 children...such as the baby bathtub and a portable highchair. It will be fun to spend time celebrating our upcoming bundle with family and friends. Any excuse to party with my girl friends! 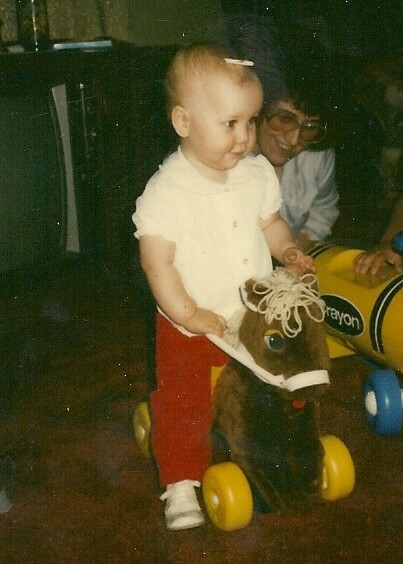 I love that 31 years later Brown Pony is still being used. It makes me wonder what toys my kids are playing with now will end up being family heirlooms that get played with by their kids. Check out my Mom in the background of this picture...Mom you rocked the 80's! Children Are A Blessing People!!! So this is a post in which I'm going to vent about certain situations that have happened to me recently. First to set the stage...since watching Logan I really don't take all 4 of the kids out shopping or what not. I have no problem taking them to structured activities like school, therapy, MOPS or Taekwondo it's just those random "I need to run into Target and get this" stops that I would try to avoid. Well lately I have been getting more and more adventurous and sometimes getting out of the house and doing something is better than staying home. I'm sure you SAHM's know what I'm talking about. Anyways recently I've taken them to all sorts of places like Comcast, the eye doctor and Wal-Mart. Since getting the new huge flat screen TV Michael asked me to stop by Comcast and get an HDMI box since we didn't have one. I decided to go with the kids and I came prepared with snacks. We stood in line at a building and in a setting that very much reminding me of going to the DMV. The kids were great! They ate their snacks we talked about having to wait our turn and how the paint color on the walls reflected off their skin and made it look green. When it was my turn I had the kids sit on the floor two on either side of me. They did great! I did have to ask Owen and Ella to sit on the floor instead of laying, but that was no big deal. The guy that was being helped at the desk next to me even looked at the kids and said, "Do you want my two?" I think he was impressed! Anyways while I was standing their waiting for the guy to bring out the HDMI box I overheard this man and woman behind me and I think the man said something positive about how the kids were behaving so well and then I heard the woman clearly...."Well they all need one on one attention!" I know I'm really touchy right now being pregnant and all, but it took everything within me not to say something to her. First I did not take all the kids with me for my eye appointment. I'm not crazy! My new glasses had been bothering my nose so I needed to stop to get new nose rests so they wouldn't kill me. Again the kids were great. They played with the toys, climbed up and down into the chairs, had snacks and were very well behaved. While waiting for the glasses lady to be available to see me the receptionist leaned over the desk to look and the kids and in a quite astonishing tone said, "Are they ALL yours!" It's not the question that bothers me at all. It's the tone that was used. Seriously...kids are smart they know what inflection is and when it's used like that they can totally understand that having that many kids is obviously a bad thing. I took the kids to the smaller Wal-Mart in Federal Way...which by the way is way better than going to the bigger one if you are going with a ton of kids. The big 3 seater carts are always available and there were ZERO lines. Anyways we were just stopping so I could buy a few things for MOPS. While checking out the cashier kindly asked, "Are these all your kids?" It was said in a nice tone and I responded with my normal, "No, (pointing to Logan) I watch Logan for a friend, these 3 are mine though!" She was so wonderful and we chatted about kids. She gave all the kids stickers and then we were on our way. I totally understand that it has to be a bit shocking to see me out and about with 4 kids under 5 and then being huge and pregnant. I understand that it is not the norm to have that many kids in today's culture, but what I do not understand nor appreciate is how people can be so blatantly rude with their tone of voice or words when it comes to talking about children. All children are a blessing from the Lord period!!!! So this is basically for my records, but if you'd like to read about our family that's cool too! Michael has been working for the King County Water District for 1 year now!!! Seriously that year went fast. I think part of it has to do with the fact that he only gets paid once a month. He's really enjoying his job and his co-workers. Me and the kids have had fun hanging out with him for lunch about once a month. Michael's boss is always quick to bring out the candy for the kids so they have been asking, "to go have a meal with Daddy" more often! My favorite part of Michael's job is knowing that everyday he leaves around 7:15 and everyday he gets home around 4:55. Love love love it!!!! Owen is gaining more and more responsibility. He's such a good helper and let me tell you I need it right now. Owen for the most part enjoys school. He is a typical first born so he tends to be a perfectionist so if he can't do it right he just doesn't want too. Coloring is a challenge for him because he can't stand the thought of not doing it perfect. We are working on this! He loves to go to Taekwondo and will be testing again in April. He seems to need the least amount of sleep of the 3 of our kids so he's been given the privilege of getting to go downstairs in the morning, get cereal and turn on cartoons....usually Jack joins him too! Owen is very into wanting to build things especially with wood. He can't wait until he's bigger so he can, "ax down a tree"! Jack is at such a great stage! He has such a great imagination! He plays wonderfully by himself although he does love to play with his brother too. They are big into wrestling right now and it usually ends with someone crying. Jack enjoys school and has been showing improvement in regards to his numbers and letters. He has graduated from Occupational Therapy for the time being. We might go back after Baby Z gets here if we feel like he needs it. He has improved so much in regards to his dexterity, but there is still work to be done. He also needs to gain more strength in his core. Jack is now completely night-time potty trained...yay for no more Pull Ups! Jack is looking forward to his 4th Birthday this summer that is going to be a Lion King theme. He is all about anything Disney...even the girly movies. He is very into characters and action figures. He found the Han Solo character that Uncle Ry got him and just today we had to watch The Empire Strikes Back and now he wants all the characters. Ella Grace is as cute as ever and she totally knows it! She is thankfully starting to use more and more words. Her favorites are still - Mine, Yeah, No and Baby! She loves to bug her brothers by arguing with them especially in the car. Ella has to be right in the mix with her brothers. She wants to be outside in the sandbox if they are there or just today she had to be outside while they were driving around Owen's RC car. She is very girly and loves pretties and baby dolls, but she can totally hang with the boys too. She just started jumping and can get both feet off the ground. Tonight she was actually singing the song, "Na na na na na na na na hey hey hey hey goodbye" and she sounded so cute. My camera is back in the shop so I couldn't get it on video dang it! Ella went pee pee and poo poo on the potty for the first time about 2 weeks ago. She hasn't really been interested in the potty since. I'm in no rush to potty train her immediately since I'm sure she would regress once Baby Z got here. I am hoping that she'll be potty trained before the end of the summer though. Okay onto me....I'm almost 29 weeks pregnant so that should say a lot. I'm feeling HUGE even though I know I will get bigger! Being pregnant in your 30's is definitely harder than being pregnant in your 20's. Although I'm sure the hardness level has been increased just due to the fact that I have 3 (sometimes 4) kids 5 and under. I have been experiencing my normal pregnancy pains like round ligament pains and my sciatic nerve, but this time around I have a new pain....my pubic bone. Oh my sometimes when I walk it feels like it's going to split in two. My weeks are busy and I'm barely home, but I like it that way. Monday & Friday are school, Tuesday is MOPS, Wednesday is Bible Study in the morning and Thursday is Bible Study at night. I am looking forward to life slowing down a bit once Baby Z gets here. Kim and I are planning on finishing school in early May, my maternity leave from watching Logan starts on May 10th. MOPS ends at the end of the May and we'll probably take the summer off from Taekwondo as well. That means our schedule will be completely free. I'm am looking forward to spending lots of time outside just lounging with the kids...hopefully we'll have a nice summer! to go to the playground!!! Of course that was last week, this week we've had snow....spring you can come anytime now!!! It's a cross-stitch I got for Baby Z. Ever since it came in the mail I've been taking advantage of almost every free moment to work on it. All I have left to do is finish the horse and the square with the cow. Then it's just onto the details. Of course I won't be able to put the name in until after Baby Z comes. 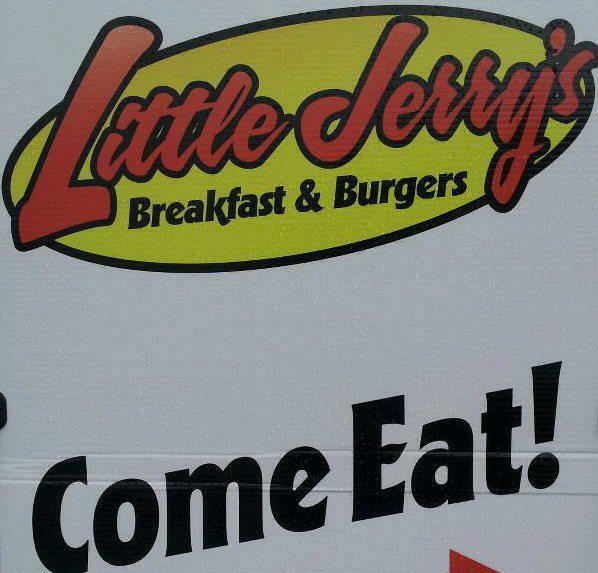 On Saturday we headed out with the kids to go visit my cousin and her husband's new restaurant Little Jerry's. It's a Seinfeld themed restaurant in the Fern Hill neighborhood in Tacoma. They are open Tuesday - Sunday from 8am - 5pm. I decided on the special for that week....The Little Jerry. Oh my goodness gracious! It was so super yummy....grilled turkey with bacon, cheese, tomato and pesto sauce. Mmmmmm!!! We got one breakfast for all the kids to share since they aren't big eaters normally! This time they devoured the food. Seriously...inhaled it! I took this picture of Jack and about 30 seconds later the eggs were gone! The food was great, the service was timely and it was fun to go out and support family. We will definitely be going back! Please check them out if you are in the area. Click here to see their Facebook page. One of Ella's birthday presents was a tutu and fairy wings from Aunt Michelle. A couple Sunday's ago after church I decided to dress her up in them since she was wearing her tights. She walked and ran around in them for quite awhile. Back when we first made hand print magnets at MOPS, Ella wasn't big enough to need one yet. The other day I found a piece of a magnet sheet that was leftover so I decided to make her her very own hand print magnet for the van. As you can see by her hand in the picture she was very excited to get her hands on it. She was a bit grumpy that day so that's why she's got the sad face. She got really mad at me when I went out and put it on the car. She wanted to keep holding it. All 3 hand print magnets! Sadly on Friday when I went and visited a friend who just had her baby Ella's hand print fell off!! I was so sad! I'm not sure why it fell off...I used the same magnet sheets. The only thing I can think off is the van was wet from the rain when I stuck it on. I'm thinking I should have probably dried it off or waited for a dry day. Thankfully these are easy to make so I'll be making her another one! Update On Toilet Paper Wall Art! After making one flower out of toilet paper I couldn't help myself so I made two more. This collection is hanging on our entryway wall coincidentally right outside the half bathroom. There really turned out so good and you can't tell they are toilet paper rolls unless you touch. The black spray paint makes them look just like metal. Friday I went in for another prenatal appointment. This time I had to drink that awful stuff so they could check my glucose. It doesn't taste too bad, but boy does it make me feel bad. I crashed so hard I was sure I was going to fall asleep right there in the waiting room! Baby Z is doing great! Strong heartbeat, active and growing wonderfully! I'm actually measuring one week ahead. I've almost gained 20 lbs so I'm right on track to gain my typical 35 lbs. It is definitely getting harder to get around. My muscles ache and I've been having problems with my sciatic nerves. I've been to a massage therapist twice now in hope to minimize the pain. I don't really notice a difference, but it sure feels nice to have her work the kinks out. Thankfully I've still been sleeping great and usually only getting up once a night to go to the bathroom. Owen is quite vocal about the baby, my belly and my boobies! Almost everyday he says something about my "tummy being huge" or my "boobies are getting bigger because they have milk in them". I'm supposed to start going in for check ups every 2 weeks now, but I'm going to talk to my doctor (she was out today) at my next appointment and find out if this is actually medically necessary. I mean I have 3 kids that I have to find a baby sitter for and gas is outrageous! Now that I'm feeling the baby move I'm not as freaked out. I don't see why I can't space my appointments out a bit more than that! We'll see! Update On Cookie Sheet Chalkboards! Last Tuesday the ladies got to make their cookie sheet chalkboards. It was definitely a hit! Here's my chalkboard hung up in my kitchen. It's been fun writing what we are going to have for dinner on it. You might notice a small addition that I've added since I first blogged about these. The idea came to me while I was laying in bed and I literally said, "I'm a genius" out loud! See in the lower right corner....that's an old plastic film canister hot glued to the cookie sheet as a chalk holder! Genius!!! There were 4 extras so I decided to make the kids their very own chalkboards. Since little hands like to pick at things I decided to laminate their names. Here is Logan's super late birthday present. The flower and Girly Girl sign are actually magnets! For my kids I think I'm going to use these in the car so I want to get my hands on some Altoids containers and I'm going to put magnets on them and that's what can hold their chalk.